Ah Christmas! For many and as far as the mainstream would have us believe, this is a time of celebration, families being together, eating, drinking and sharing gifts. And on the flip side, Christmas time opens our eyes to people who don’t have as much as we do, who are perhaps isolated or cannot afford to enjoy this time of year. How are you getting ready for Christmas celebrations? If you haven’t yet worked out what you’re cooking for you and your festive guests, this recipe is a perfect centrepiece that all will enjoy. 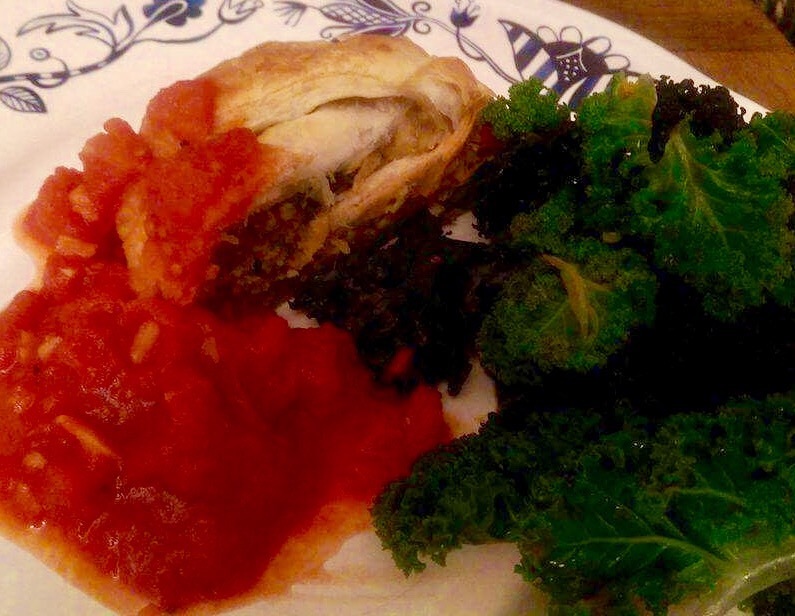 Easy to make and scrumptiously flaky and satisfying, you can serve this lovely loaf with a fresh tomato sauce and lemony kale. The filling can be prepared ahead of time and stored in the fridge. Start with the lentil filling: put the lentils in a pot with the vegetable broth. Cover, bring to a simmer and cook for 35 to 40 minutes until liquid is absorbed and lentils are soft. Mash the lentils with a potato masher. In a small bowl mix together the flax or chia with water to thicken. Heat the olive oil in a pan over medium high heat, then add the leek, parsnip and carrot and sauté until they soften, about 5-10 minutes. Add the mushrooms and cook for another 5 minutes. Add in the garlic, salt, pepper, thyme, rosemary and cayenne and sauté about 2 minutes more. Remove from the heat and mix in the lentils, nuts, flax or chia mixture, oats and flour. Leave to cool for 10 minutes. 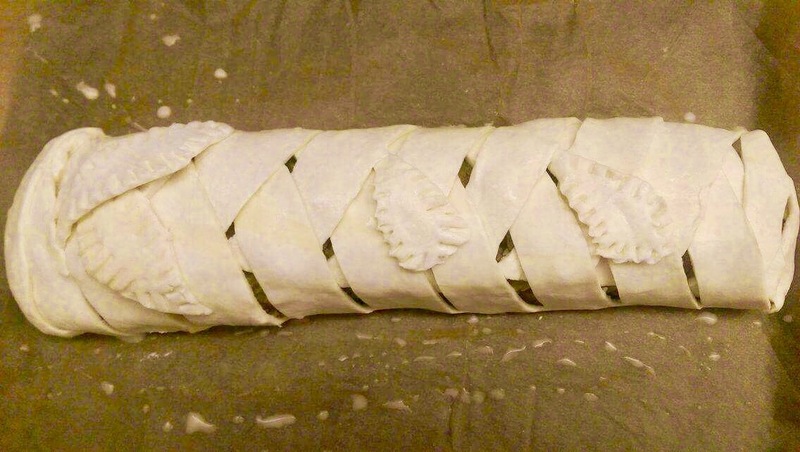 Roll out the puff pastry sheet into a rectangle about 10 inches by 14 inches. Transfer the pastry sheet to parchment paper on a baking sheet. 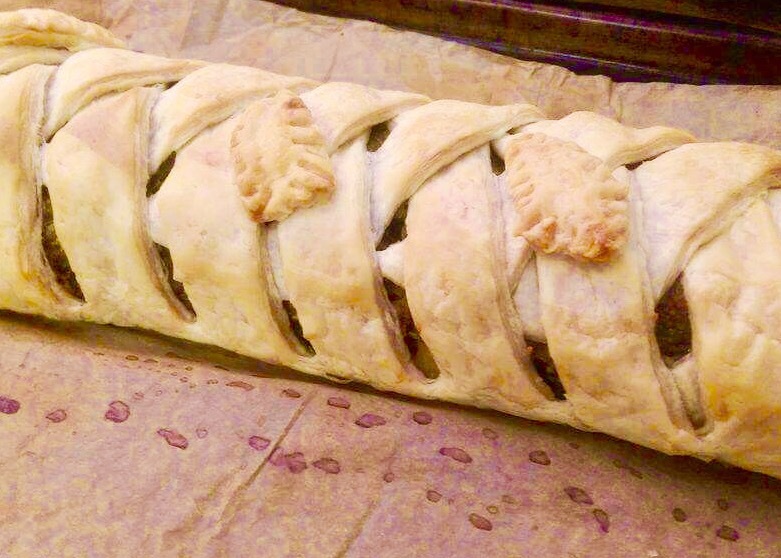 Form a loaf shape with the lentil mixture down the middle of the puff pastry, leaving a bit of room at both ends. Cut strips down each side about 1 inch wide. Cut off the top two and bottom corners and set aside. Now fold up the top flap over the end, then take the top left strip and fold over the loaf. Fold the right top strip and fold over, forming an x, then continue, alternating all the strips until the end of the loaf. Tuck in the bottom fold, and make sure the gaps between strips are small. Decorate the top with leftover pastry pieces. Brush the top with non-dairy milk. Bake for about 40 – 45 until golden brown. ﻿Serve hot from the oven with a warm tomato sauce and lemony kale.